While first skating on it I could instantly feel the increased support over the old R2. I could crazy run on it for some reason. Every step felt sure and I didn't have to worry about setting down wrong. Definitely a good off the line boot. Same at high speed, very stable. Much better then the old R2 for putting a 90mm or 100mm frame on this boot. No complaints here. It is now almost identical to the C4 and C6 boots other then the fact the shell is plastic and the C4 is carbon and the C6 is fiberglass. I have no problem skating on a plastic shelled boot, in fact if I wasn't told it had a plastic shell I would have had no idea while skating. Oh, the bottom looks cool with it's blue carbon look instead of the standard black carbon look. I'm happy to see you can get the 2007 R2 with a 5x80 frame. Have you seen 5x84 or a 90mm or 100mm frame on a size 3 boot? It's not pretty. 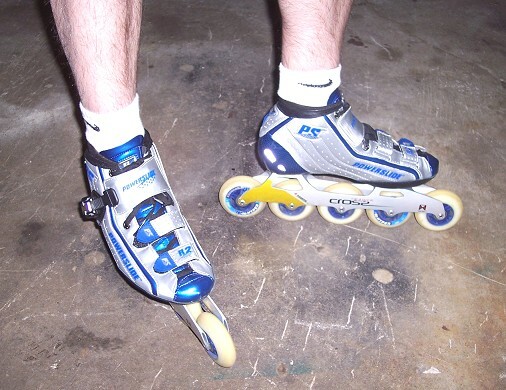 The 5x80 is also a great frame to keep the ankles strong for distance skating. It's also a good frame for beginners to practice getting an outside edge without the high amount of torque a 90mm or 100mm frame puts on an ankle. Powerslide now has a Matter 80mm 83a wheel to complement their 80mm frame. The Matter 80mm 83a wheel will now be able to replace the Hyper Bankrobber 80mm 82a, 80mm 84a and +G 80mm 83a, 80mm 85a wheels that have been discontinued. Being that I still enjoy skating on 80mm wheels for ultra distance I am very happy to see Powwerslide offer an 80mm 83a wheel to replace Hypers discontinued 80mm wheels. I haven't found a wheel to equal Hypers Bankrobber and +G wheels but the Matter wheel is the first wheel that does. Thank you Powerslide. Getting back to the 2007 R2 or should I say the 2007 C2. Again the new R2 is much more like the C4 and C6 then the old R2. I currently skate on the C4, C6 and there was quite a gap between these and the old R2 but now I can say that I would easily skate on the C4, C6 or the new 2007 R2. Addition: When Powerslide released the 2007 R2 they were not going to offer it as a boot only but as of 10-02-06 we were informed they will now be selling it as a boot only (good news). Addition: Just like the C4 and C6 the R2 also needs to be tabbed. The tabbing article is Here. Dollar for dollar, the Powerslide R2 boot is, without a doubt, the absolute best value on the market today. Greg O.